To view The New England Golf Association ®, established in 1926, is a 501(c)3 amateur golf organization comprised of leaders from the six New England golf associations – Connecticut, Maine, Massachusetts, New Hampshire, Rhode Island and Vermont. 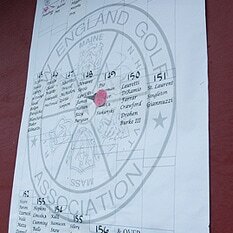 Each championship event is held on a rotating basis at golf clubs located at one of the six New England member state associations. To view a list of future championship sites, click here.